Five of Swords (R) says you are experiencing the despair felt after a defeat. See how your mind creates doubt and pessimism – look directly at your defeatist thinking. You defeat yourself with your own doubt and skepticism. It is time that you look at changing your own attitudes – let go of your pride and release this narrow view point – your own “ego” is inhibiting you. An old wound has been opened and you are experience fear associated with that memory – thoughts that history might repeat itself or that you could be hurt again. Your vision has been distorted by the past. Allow yourself to be sensitive to this deception in a personal situation – be receptive to the things that are causing you all these emotional problems. When you are involved in an unfair decision that is hard to correct – be patient with your emotions. Too much or too little mental freedom – uncertainty. Too many or too few choices. Mind looks at itself ineffectively and will tend to be too passive and lax or will be over enthusiastic and cause havoc. Criticism of self and others can be harsh and inaccurate. A sharp tongue. A sense of mental loss rather than gain. Anger, confusion, argument, covering things up, impulsive, impatient, hasty, nervous, stubborn, complacent. Inappropriate worry, sadness, depression, disappointment, guilt or shame. The general is concentrating on his plan of retreat. Do you expect to get “stung” in this situation? What is causing division in the solidarity of your group? Why don’t you feel good about what you are doing? What do you need in order to feel good? What would be the ethical thing to do? What is so important to you that you have to prove everyone else wrong? 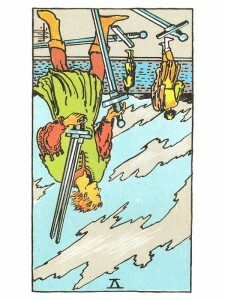 Between the Four and Nine of Swords: Could signify hospitalization – look into your health. Next to Devil: Careless spending will result in financial distress. Next to Magician: You are misusing abilities – do not become overconfident – reconsider any recent decision. In the first position: With your gifts you will be called upon to fill in where there are gaps, where bridges need to be built and missing links filled. In the second position: You can be too quick to shift positions. Restlessness, inconsistency, a sharp tongue, may have weakened your foundation. In the third position: Avoid the distortions of this archetype by keeping them in mind – be decisive in “small steps”, with things which you have control over and can be certain – then expand. In the fourth position: Your passion may be for the heat of the argument or simply to possess large quantities of information for your own satisfaction, to be clever for the sake of being clever. In the fifth position: The question here is about ideas and goals – not the emotions. In one extreme, you are so oriented to your freedom of expression and the future that you may be leaving something important behind. In the opposite extreme, you are not as free as you should be, preferring to look backward, hanging onto old issues or ideas that are truly finished except in your mind. In the sixth position: Your heart may not know how to react to this mental delay. In many respects it puts more of a spotlight on the Emotional Plane to take the lead, at least for awhile. In the seventh position: As the mind whirls about here and there picking up bits and pieces, it must be clear on where everything comes from and give credit where credit is due. In the eighth position: At this point you may be feeling one of two extremes: First, that you are profoundly affected and having trouble adjusting to the mental glitches in your Physical Plane. Second, that you are unaffected, even glib and not taking appropriate stock of what has happened. In the ninth position: Depression and disappointment. On the one hand, this heart is indifferent to the problems of the Mental Plane. On the other hand, you could be exacerbating the problem with overreaction and misplaced sentiment. In the tenth position: With freedom can come the crushing weight of uncertainty and heavy burdens on free will, but grace here spares you this sort of agony to give you a healthy push into the stage of your Higher Emotions.